Mauricio Pochettino will be without Harry Kane until early March after the Tottenham striker suffered an ankle injury in his side's Premier League defeat to Manchester United. England captain Kane, who has scored 20 goals for Spurs in all competitions this season, is expected to miss around a dozen matches including the EFL Cup semi-final second leg against Chelsea. Spurs rely heavily on Kane for goals and with a thin squad only boosted by one solitary signing in the last year, Pochettino does not have a lot of other attacking options from which to choose. So, who might fill in for Kane over the course of the next six weeks? 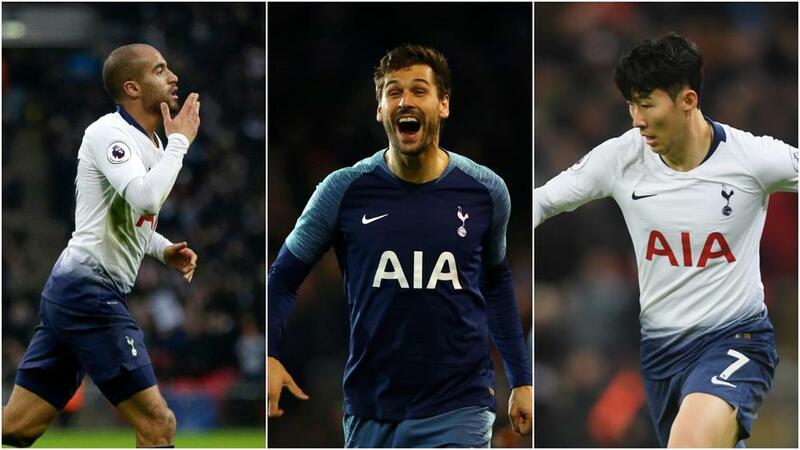 We take a look at some of the players who could help Pochettino cope without the World Cup's Golden Boot winner. The most obvious player to fill in for Kane is Son Heung-min, who has already scored eight Premier League goals this season. Unfortunately for Spurs and Pochettino, he travelled to the United Arab Emirates to join South Korea's squad for the Asian Cup after Sunday's 1-0 loss against United. Son's return date will depend on Korea's progress, but they are among the favourites to win the tournament and the final is set for February 1. If they go all the way, Son will miss five Spurs matches before returning to face Leicester City on February 10. Pochettino will need another option, at least in the short term. The man to fill the gap left by Kane, at least until Son is back in north London, could be Lucas Moura. The Brazilian started the season in brilliant form, featuring in a two-pronged attack alongside Kane, with his vibrant performances earning the Premier League's Player of the Month award for August. Lucas has gone off the boil a little since then, but the former Paris Saint-Germain attacker may thrive if he is given a central role once more. Lucas has been sidelined by a thigh injury recently, but should be fit to face Fulham on Sunday. Athletic Bilbao had hoped to re-sign their former striker Fernando Llorente this month, but Kane's injury will presumably mean the 33-year-old will not be allowed to leave Spurs during the January transfer window. Llorente has only played 36 minutes in the Premier League this season across six substitute appearances, but he did score a hat-trick against Tranmere Rovers in the FA Cup third round earlier this month. It is over a year since Llorente scored in the Premier League, though. The chances of Llorente's fellow striker Vincent Janssen being pushed up the pecking order by Kane's injury seem remote as he is completely out of favour under Pochettino. A more enterprising move than turning to either Son, Lucas or Llorente could be to push Dele Alli into a more advanced role. Kane's England team-mate typically operates in a central midfield role, but certainly has the eye for goal needed to play up front. Alli has scored 41 goals and provided 27 assists in 122 Premier League appearances for Spurs, a superb return for a player who is still only 22. Liverpool's success has come without playing a traditional striker, so could the same tactic work for Spurs? Pochettino has shown more faith in young players than most Premier League managers, so perhaps the Argentinian could use Kane's absence as a chance to blood another exciting talent. Kazaiah Sterling is a highly rated 20-year-old in good form, having scored four goals in his last four appearances for Spurs' Under-23 side in the Premier League 2 competition. Sterling has already played in the Champions League for Spurs and although it would be some leap of faith to throw Sterling into the fray, Kane was an untested youngster once. Pochettino has worked wonders with very little recent investment in his squad, so he could certainly argue he has earned the right to use the transfer market to find a replacement for Kane. But January is not the ideal time to be shopping for players, with only those who are unwanted at their clubs usually available to be signed. Pochettino would also likely have to find a striker content to play a support role to Kane when the England captain returns to fitness.